accomplished using one of two methods. 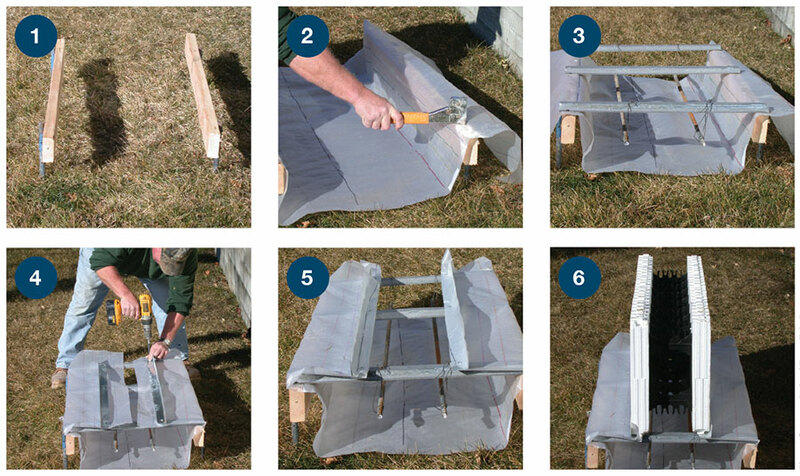 The drawback to this method is that it creates a cold joint at the footing, and the ICFs have to be attached to the hardened concrete using foam adhesive or metal track. Some installers find that the vertical rebar is significantly out-of-alignment, and new steel has to be drilled and glued into place. 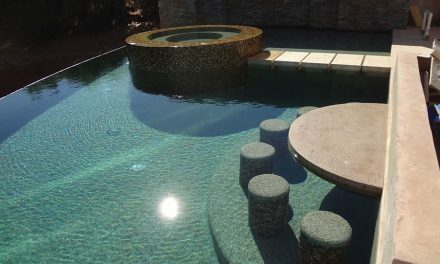 The second, less-common method is to “wet-set” the forms, placing the first row of blocks directly into the wet concrete. 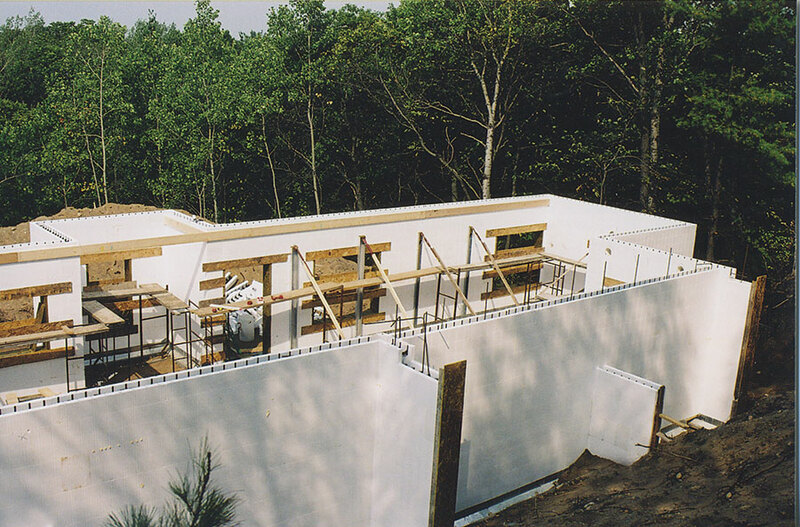 The drawback to dry-setting is that it creates a cold joint at the footing, and the ICFs have to be attached to the hardened concrete using foam adhesive or metal track. This high-stakes technique can save considerable time—if it’s done correctly. pump truck only has to make one visit to the jobsite. Additionally, it ensures reinforcing steel is centered in the wall’s concrete core, and reduces the safety hazard caused by exposed vertical rebar. 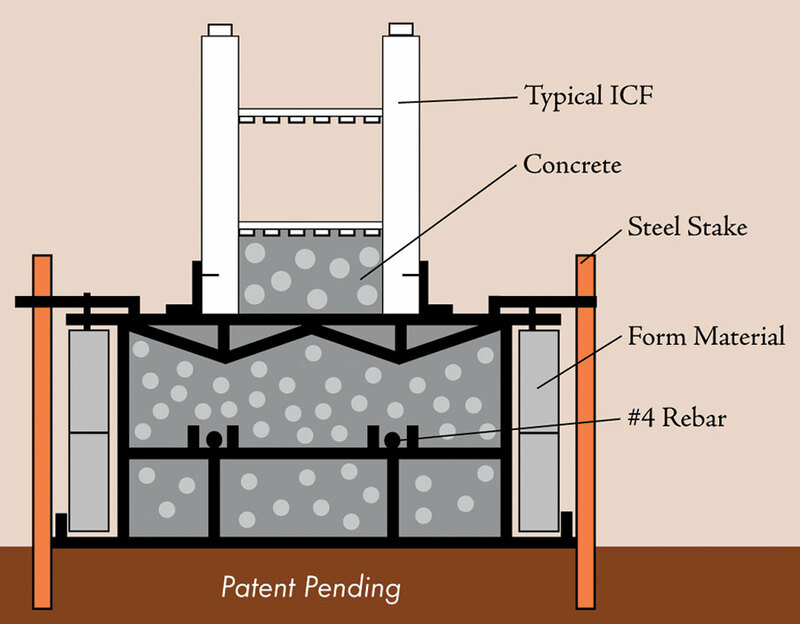 And since the forms are embedded directly in the concrete, it eliminates the need to attach the ICF to the footing. However, without a good, trained crew and precise layouts, wet-setting can be disastrous. The “screw-up factor” is lurking here, given the time constraints of working with wet concrete, and mistakes at the footing level typically get amplified as the walls go up. Luckily, in the past year or two several new systems have been developed that eliminate much of the risk, making wet-setting easier than ever before. 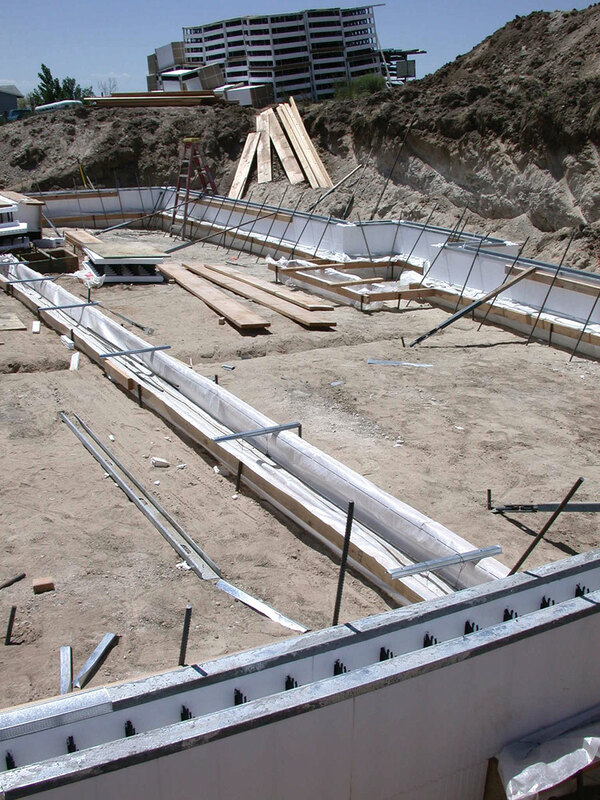 Despite the risks, some contractors still swear by the traditional wet-set method, which generally follows these steps: First, the footing forms are laid out and staked just as with any job. Then a set of string lines are set up above the forms. 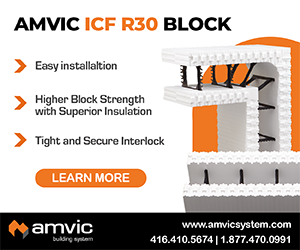 These strings correspond to the exact height of the first course of ICF blocks and mark the outside edge of the ICF wall. Getting these string lines dead level, perfectly square, and exactly in the right place is critical, as the entire build will only be as accurate at the string lines. Experienced contractors recommend placing the string stakes well outside of the footing forms to prevent accidentally bumping them when the footings are poured. Once the strings are in position, pour the footing, screed the top, and quickly double-check the strings for level and square to make sure they didn’t get moved during the pour. Make whatever adjustments are necessary, then carefully place the corner forms, building toward the middle. 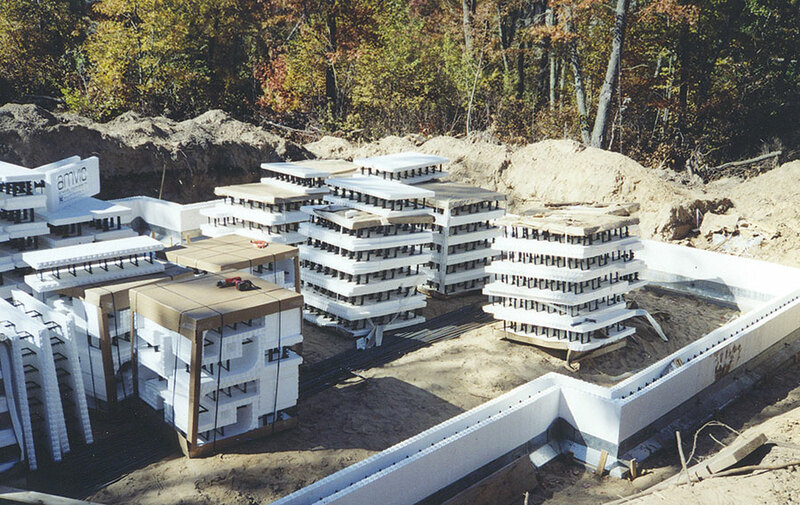 Like a block mason building with CMU, each ICF is squared to the string and adjusted to the perfect height. Brad Partridge, a Florida installer who uses this method, says the job will go more quickly and easily if several forms are connected end-to-end before placing them on the footing. “We have found that using plastic ties between blocks on the first course helps to keep the block in line and makes the second course work go faster,” he says. Zip ties will work with any ICF. A few brands, such as Arxx (the Claw) and PolySteel (Carolina Clippers) have developed special wire ties for this purpose. Plastic braces from Pro Set keep the forms centered during the pour. 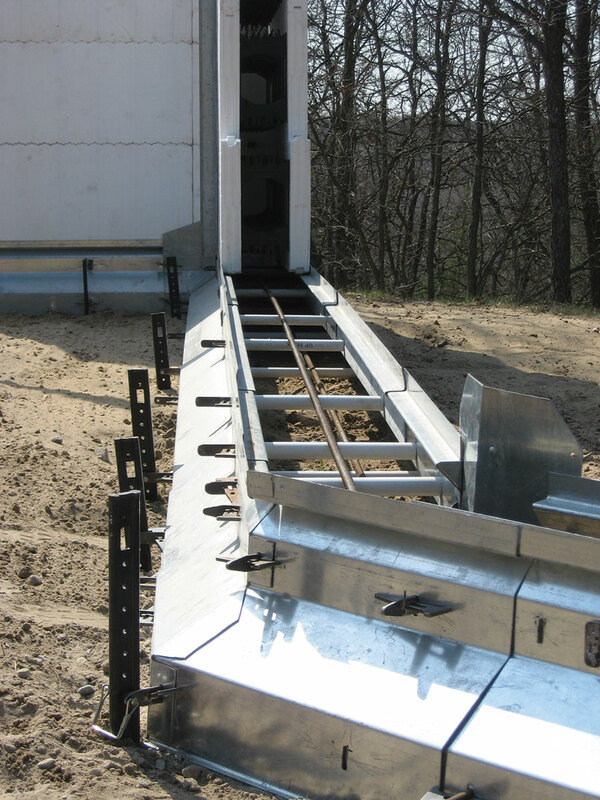 They work with any stay-in-place footing form system. Once the first course is in place, the crew stabs the vertical rebar into the still-wet concrete. Chris Johnson a Napa, Calif. contractor, cautions that this method only works “if you have a crew big enough so you have guys pouring, leveling, setting the block and checking it’s accuracy for straight, plumb and level at the same time,” which he estimates takes a crew of four or five, minimum. Keys to this method are an accurate string layout and a large, trained crew that works well together. Taggett sets his string lines so that the blocks get embedded a half inch into the footing. A video demonstrating his method is available on our website. Last year, 440 Products introduced Pro Set, a plastic bracket designed to make mono-pour jobs go more smoothly. The Fastfoot method uses a proprietary fabric, coupled with a system of reuseable stakes, tracks, and boards, to create a solid mono-pour system. Next, he screws “hat-track” or sound channel across the tops of the boards every two feet on center. These are used to hang the horizontal rebar in the footing. The Fastfoot is then folded back over the hat-track and sheet metal angle strips are screwed on, sandwiching the Fastfoot in between. 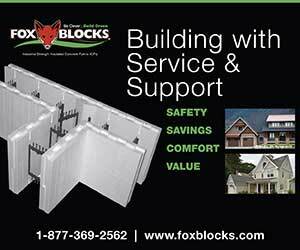 The spacing between the angle strips is equal to the width of the ICF block. The footing is now ready for stacking. Menzel uses plastic zip ties to secure the blocks to the hat track and eliminate float, but says screwing through the sheet metal into the furring strips would also work. “You can ensure that your walls are laser-level, plumb, and straight before you ever pour,” says Menzel. He pours two courses with the footing. If the wall is going taller than that, he tapes the tops of the blocks to keep the interlocks clean, and stacks and pours the rest later. Once the concrete has cured, the wood can be stripped and reused. The boards should be perfectly clean because they were wrapped in fabric. Scot Smyth, a contractor who used this method for his home in Colorado, recycled all his footing boards by using them for window bucks. 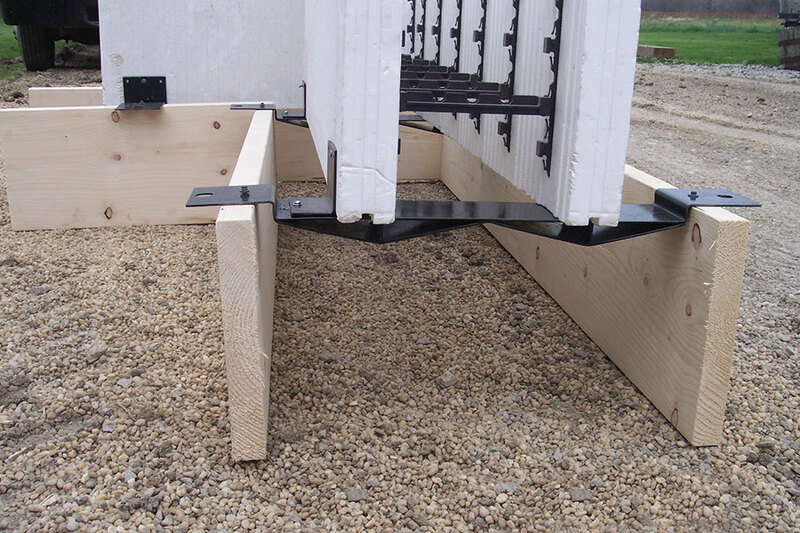 The Key Footing Form, developed by Neal Lesmeister over the last several years, is the most elaborate solution to wet-set or mono-pour challenges. 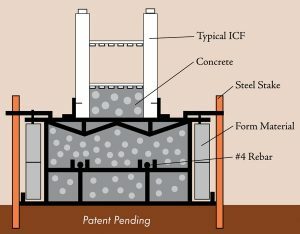 Using the steel forms, the entire ICF wall can be set up and braced before the footing is poured. The forms are made of heavy gauge steel to stand up to a lifetime of use, and form a bell-shaped footing. Spacers, made from schedule 40 PVC pipe, control the width of the cavity. Lesmeister says an average footing will use about $25 worth of pipe, and can be cut in less than five minutes. The spacers are held in place with regular bolts and wedge keys. Once assembled, the forms are staked into place and sprayed with a form release agent. 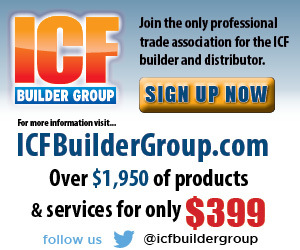 Then the ICF build can begin. Lesmeister recommends connecting the corner forms to the footing forms with a heavy duty screw and connecting the intermediate blocks to the PVC spacers with zip ties to keep things from moving. If the wall is tall enough to require bracing, a special base plate is attached with a self-tapping screw for the strongback to rest on. The system is compatible with any bracing system. A video of this method is available on the icfmag.com website. Wet setting techniques have clearly evolved significantly over the last several years. 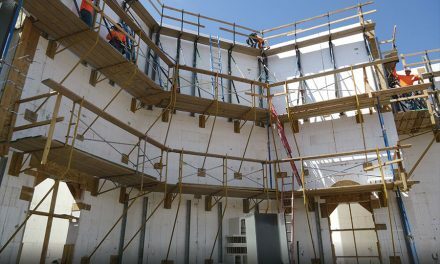 Using the new technologies mentioned above, ICF contractors may discover significant time and labor savings, especially on stem-wall construction. 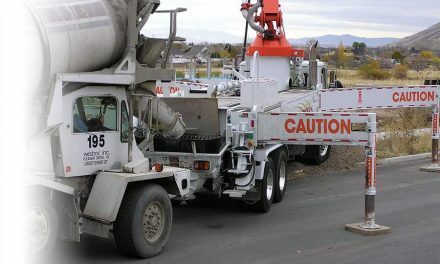 Using one of the mono-pour methods listed above, a crew could feasibly build and pour an entire stem wall in the time previously required to install the footing. Keep in mind, however, that wet-setting always involves a race against time, and everything must be staked and set rock solid prior to the pour.